It was a busy morning at Long Sandall. It seemed as though most of the BW staff in the region seemed to have turned up. I had a chat with a couple of people that turned up on Wharf II and Nottingham.The reason that they were on the visitor moorings was because of break-downs. The Wharf II at 20 years + old is in dire need of some TLC. Gauges keep shutting down and starting up. OK probably just bad connections but if time isnt given to do minor jobs then they end up as something major. Nottingham has had a refit and had the engine reconditioned but now and then the electrics are playing up. Time needed to be spent on it. The William Jessop was first away and into the lock. 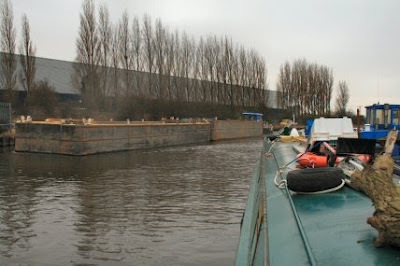 Shortly after came the empty barges for the spoil. The first major work that Jessop is known to have carried out was the Grand Canal of Ireland. This had begun as a Government project in 1753, and it had taken seventeen years to build fourteen miles (21 km) of canal from the Dublin end. In 1772 a private company was formed to complete the canal, and consulted John Smeaton. Smeaton sent Jessop to take control of the project as principal engineer. Jessop re-surveyed the proposed line of the canal and carried the canal over the River Liffey, via the Leinster Aqueduct. He also drove the canal across the great Bog of Allen, a feat comparable with George Stephenson’s crossing of the Chat Moss bog with the Liverpool and Manchester Railway. The canal was carried over the bog on a high embankment. The boat started moving and into view came the empties from just up the canal. 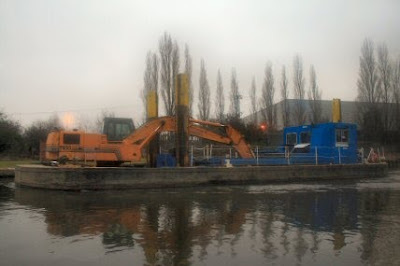 The Derwent was doing the pushing and stashed the barges alongside the mooring for the lock as though it was the size of a mini. Must have done it before. 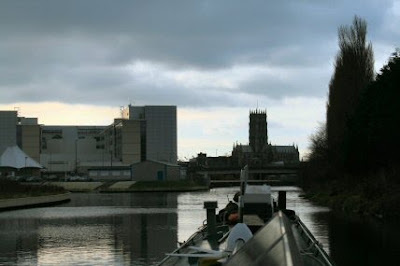 Soon the engines of both boats inside were running and with help from one of the BW staff (I bet they don't go to the same Customer Care school at the Railways) gave me a hand to swing the boat around so that I could head up stream to Doncaster. I left Tim to follow along after me as I needed to move to let the BW boats out. The run up to Doncaster was uneventful but chilly. I gave the new hat from Kath an outing and it did the job perfectly. It is one of Doncaster's most architecturally important buildings. It was built by architect Sir George Gilbert Scott in 1858. It replaced a 12th century Norman building that burnt down on the last day of February 1853. It was described by Sir John Betjeman as "Victorian Gothic at its very best". Amongst its treasures are a clock by Dent (the same designer the Palace of Westminster Clock more usually known as Big Ben) and a spectacular 5 manual organ by the renowned German organ builder Edmund Schulze (1824-1877).